- Volumes ids were limited to 3 characters: fixed. - "Project" menu: "Iconify" and "About" items grouped. - Swedish and German translations completed. - Greek readme and tutorial files improved. - Current path available at each level via buttons. - Various sorts (name, size, date, type, extension, rights, comments). - Possible filter on filenames. - Preview images, icons, "text" files, volumes and drawers sizes. - List or icon view (thumbnails). - Customizable display of .info files and drawers at the top of the list. - Cut/copy/paste/duplicate files, directories and links. - Delete one or more files, directories or links. - Creation of drawers, with or without icon. - Most actions are possible on several files. - Up to 5 customizable buttons (image, action). 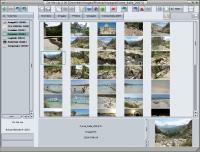 spreadsheet, web, music and video software (among Amicygnix software). - Effective ergonomics: icons, contextual menu and keyboard shortcuts.